A teen driver, who killed four people and injured three when he ploughed a stolen car into a people carrier, told police after his arrest: ‘You can remand me if you like, I’ll get out and I’ll do, bang, the same thing again’. Brothers Elliott and Declan Bower, and a third defendant who cannot be named for legal reasons, were brought before Doncaster Crown Court this morning to be sentenced for their involvement in a crash that claimed the lives of three adults and a baby boy on November 9 last year. 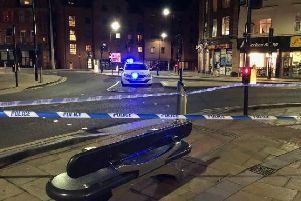 The collision took place in Main Road, Darnall and caused the deaths of Adnan Ashraf, 35, his 16-month-old son Mohammed Osman Mustafa Bin Adnan; and husband and wife Miroslav Duna, 50 and Vlasta Dunova, 41. Prosecutor, Richard Wright QC, told the court how at the time of the collision the Bower brothers were wanted for questioning by the police in respect of ‘serious offences’ and intended to evade arrest by ‘any available means’. Police officers searching for the brothers located them on the Sheffield Parkway on the night of the collision, driving a stolen VW Golf with cloned license plates. Elliott, 19, was driving the vehicle, Declan, 23, and the third defendant was in the passenger seat. “Having noted the police vehicle, Bower left the Parkway at speed. He crossed a double solid white line and drove at speed on the wrong side of the road on a blind bend. “It was driven the wrong way around a roundabout and then doubled back onto the parkway. The Golf was driven at massive speeds far in excess of 100 mph whilst on the Parkway in wet conditions with many other road users present,” said Mr Wright. He told the court that Elliott left the Parkway at speed and is estimated to have been travelling at speeds in the region of 79 miles per hour when he ‘ploughed’ the stolen vehicle into the VW Touran that was carrying the four killed and three seriously injured in the collision. Mr Wright added: “There is no evidence of any effort to avoid the collision taken by Bower. Mr Wright said the ‘first thought’ of Elliott and the third defendant was to ‘make a run for it,’ not only leaving behind the four killed and three injured in the collision, but also leaving Declan in the back seat with a broken leg. Elliott was interviewed by police in the days following the collision, and initially denied being the driver of the vehicle. The third defendant told police during his interview: ‘That was no ones intention what happened, I cried when I heard last night’. But when he was asked to sign the officer’s notebook to confirm this reply, he instead repeatedly swore at the officer and refused to sign. Mr Wright said all of the defendants had failed to express any remorse for their actions. Mr Wright said: “She remains gravely unwell and there is no clear prognosis of how or if her significant brain injury will recover. “Livia was just three. She was a happy healthy child with development consistent with her age. In the collision she sustained a massive brain injury. “It is far too early to predict how she will progress. She has impaired vision and may lose her sight completely, she cannot stand or walk, she has to be tube fed and may never improve her ability to feed, she is unable to speak more than one or two words. aggravating factors and multiple fatalities there could be no objection to taking 14 years as the starting point for sentence. The Recorder of Sheffield, Judge Jeremy Richardson QC, adjourned the case until 3pm for sentence today. Elliott is due to be sentenced for four counts of causing death by dangerous driving and three counts of causing serious injury by dangerous driving as well as charges of handling stolen goods and possession of cannabis. Declan will be sentenced for charges of aggravated vehicle taking and death caused by an accident with aggravated factors. He is also charged with handling stolen goods, two counts of driving while disqualified, two counts of driving without insurance, possession of a bladed article and possession of cannabis. The third defendant, now aged 18, will be sentenced for charges of aggravated vehicle taking, death caused by an accident with aggravating factors and possessing cannabis.